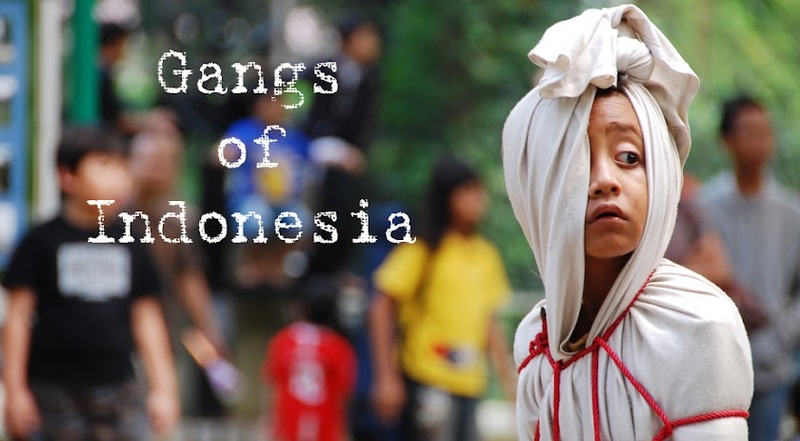 "In some countries they drink alcohol," said Nyoman, driving along a sun-dappled lane through the rice fields of southeast Bali. "Here we drink gasoline." "You Balinese are very strong," I admired. Nyoman chuckled. 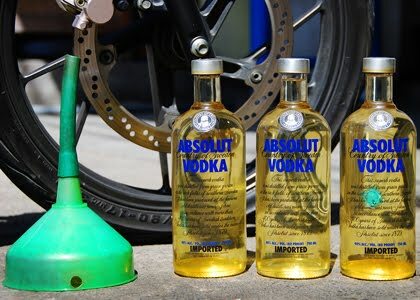 In Bali petrol is sold in Absolut Vodka bottles along the roadsides. A one-litre bottle sells for Rp5,000 ($0.50). "Around 20 customers stop here each day to fill up," said gasoline-gal Wayan, who operates a motorbike workshop the size of a one-car garage along the north road from Legian. "Motorbike riders usually buy two litres per stop, and I often sell all of my daily supply," Wayan said, waving her hand towards her stock: gleaming golden delicious along three neat rows of a homemade wooden display rack. 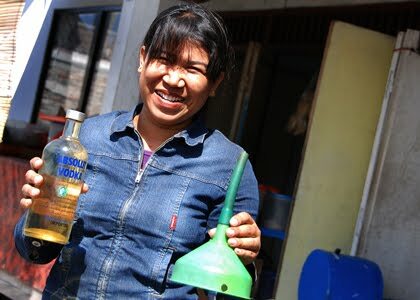 She buys her daily stock from a local petrol station and brings it home in a jerry can. "Cinta vodka," a man sings from the oily shadows of the motorbike workshop. Cinta (pronounced chinta) means love. The discarded bottles are collected from restaurants and bars, but the preference is almost exclusively for Absolut. "Absolut holds exactly one litre," explained Nyoman. "Other bottles hold a little more or a little less. Absolut Vodka: pas." Pas means something is a really good, or exact, fit. 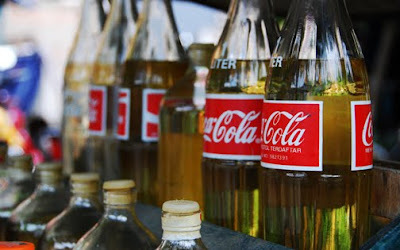 Back in Jakarta, petrol is sold in Coca-Cola bottles. I wonder which are the bottles of choice for other cities in Indonesia. If you spot any unusual bottles, let me know. I saw Bintang beer bottles used for this purpose the other day in Flores ... scary, because the color (and some would say the taste)is similar. in my home town (palembang) they usually use the mineral water bottle. I would call it creative! By the way, in Tanjung Pinang (capital of Kepulauan Riau Province) and other neigbouring island such as Batam and other, the street gasoline seller is using the Mineral Water plastic container. Wow! Amazing Blog, It Seems Very Interesting and Attractive. And here i found Some Useful Material thanks For Your Effort to write this Superb Article.Gud Luck!!!! !